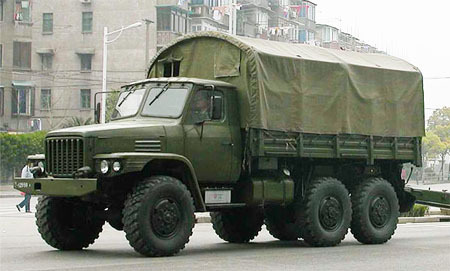 The Chinese EQ240/2081E truck by Dongfeng are the most widely equipped troop/cargo carrier trucks in the PLA service. The EQ240 (later renamed EQ2081E) 2.5 tonne truck entered service in 1975, followed by the EQ245 (later renamed EQ2100E) 3.5 tonne truck in the early 1980s. The early models of the EQ2081E and EQ2100E were powered by a Chinese indigenous petrol (gasoline) engine, while newer variants are powered by a 160hp (118kW) Cummins 6BT5.9 turbo-charged, 6-cylinder, liquid-cooled, 5.88 litre diesel engine produced by the Dongfeng Motor locally under license.